One common frustration for businesses using Facebook is the never-ending changes. Facebook is always updating the features, functions, and layout, to optimize the user experience (and of course, profitability for Facebook). One of the great features of the WordPress platform is the ease of selecting the first view your visitors see when they come to your web site. Some people choose to use a static page welcoming the visitor to the site, describing the site, or delivering some kind of call-to-action. Others may want to use that front page to highlight their very latest content. To make browsing recent posts even easier, many bloggers display just post titles and summaries in order to let the visitor see what their site is about. The following video walks you through these options. Using Social Media To Date A Celebrity? Football season is over, so there’s no reason to talk about Broncos quarterback, Tim Tebow, right? 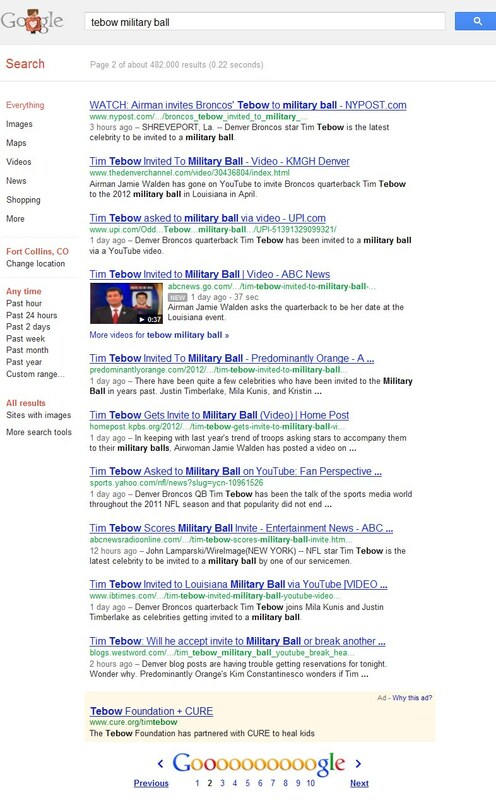 YouTube to convince the Broncos quarterback to be her date for the 2012 military ball. After watching the video, take a look at the cues of this social media campaign, and see what really got traction for her. Creating a simple campaign slogan that can be used as a tag. Say yes, Tim. Transparency. The public is a sucker for an honest story (especially a fairytale) that comes from the heart. In emphasizing the phrase, ‘Say yes Tim’ she’s created a simple tag or hash that lends itself to social media shares, retweets, etc. Great leverage in the viral factor- thousands of shares in the internet and social media. Google returns 607,000 results for the phrase ‘Tebow military ball’ Now being discussed everywhere from Twitter (especially the ‘Say yes’ refrain) to ESPN, to Huffington Post, and even major news networks. Social media can be used to get the attention of celebrities, politicians, or those who we would otherwise not have access to. As with many successful social media campaigns, Airman Walden’s message has extended extended beyond the boundaries of social media. For example, she was invited to appear on Fox News, where she could emphasize her full intent of the campaign, and promote the honor of the military members in her region. Now we’re just waiting for Tim’s response. What do you think – Should he go? There was a ripple in the Twitter ocean this past week. It seems Ashton Kutcher, the disputable Twitter King, is placing himself in Twitter time-out – perhaps permanently – as a result of a social media blunder. That was published to his 8+ million followers. After coming under immediate fire from the Twittersphere, Kutcher deleted the post and began backpedaling. He tweeted, “Heard Joe was fired, fully recant previous tweet! Didn’t have full story.” Then he followed up with another short series of tweets culminating that he’s signing off from Twitter for a bit. But then he took it a step further, announcing that he’ll be handing over the management of his Twitter stream to a social media management company he had previously created. So now he’s the ‘proxy’ king of Twitter? Kutcher detailed in a blog post that this all started when he saw a headline on TV that Paterno had been fired. He said he assumed that it was because of Paterno’s recent football record and his age, so he fired off his tweet. His story’s a bit of a stretch, since the Penn State story was very widely reported, even before Paterno was fired. Additionally, one would think that Kutcher would be especially aware of the consequences of tweeting before thinking, given both the size of his following and his his recent expressions of frustration in the way gossip spread regarding his marital troubles. If he did, in fact, write that tweet without regard to even the smallest details of the case, his admission of idiocy seems to be accurate. The Lesson: Regardless of the intent at the time, Kutcher’s many mea culpa’s were logical. Not because he’s not entitled to have the unpopular opinion that he initially expressed, but because he’s well aware of his purpose for being on Twitter. Kutcher’s purpose is the same as many pop stars: “to be popular”. Kutcher enhances his marketability or ‘box-office’ value not by being controversial, profound, informative, or intelligent, but by being liked. Since Kutcher has removed himself from direct access to his feed, many feel he’ll lose a significant part of his massive following. Then again, I find it hard to believe that @aplusk (Kutcher on Twitter) is as big an idiot as he’s claiming to be. The story is covered by hundreds of news outlets, and announcing the outsourcing of his tweets brings a nice bit of publicity to his social media management company. Furthermore, many people (well, at least people who care about pop celebrities – still, an astonishing number) will sympathize with his ‘mistake’, ultimately increasing his following – and commercial value – even more. Knowing one’s purpose in any social media channel is key in guiding activity. Whether proactively posting content or reacting to criticism or blunders, keeping the overall, big-picture goals in mind will guide the decisions at each step. So especially those of you in my social media courses, what are the other takeaways you can find in this example? Does this example demonstrate anything you can apply or strategically avoid in your own personal or business strategy. Not everyone has the same social media objectives as pop stars (thank goodness), but keeping your big picture in mind will help guide your routine activities.